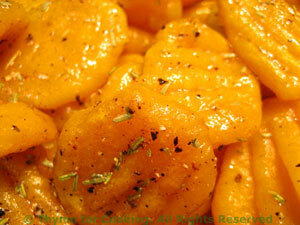 Pumpkin Gnocchi, with Browned Butter Sauce, Thyme for Cooking, home-made. This Gnocchi, made with pumpkin rather than the more traditional potato, is a lovely golden color with the delicate flavor of winter squash. Finished with a simple Brown Butter sauce and sprinkled with a few herbs, it makes a lovely side dish, perfect with more robust meats and seafood. Knead by hand, adding flour, until dough is not too sticky to work with. If you are using fresh pumpkin purée you will be adding more flour than if using purchased. When you can form the dough into a nice, soft, smooth ball you're done. Cover with a paper towel and let it rest for 10 - 15 minutes. Pinch off a small piece of dough, about the size of a golf ball. On a floured surface, using the flat of your hands, roll it into a cylinder 3/4 - 1" (2cm) thick. Slice off pieces about 1/2" (1.25cm) thick. Add the gnocchi, about 1/3 at a time and cook until they float, 2 - 3 minutes. When light brown add the oil. This slows the browning, preventing it from getting a 'burnt' taste. Add the herbs and lots of pepper - to taste. Stir-fry quickly to reheat and lightly brown, about 3 - 5 minutes, depending on how cold the gnocchi is and how crunchy you want the outside to be.